All nodes require Internet access for administrative purposes such as package installation, security updates, DNS, and NTP. In most cases, nodes should obtain Internet access through the management network interface. 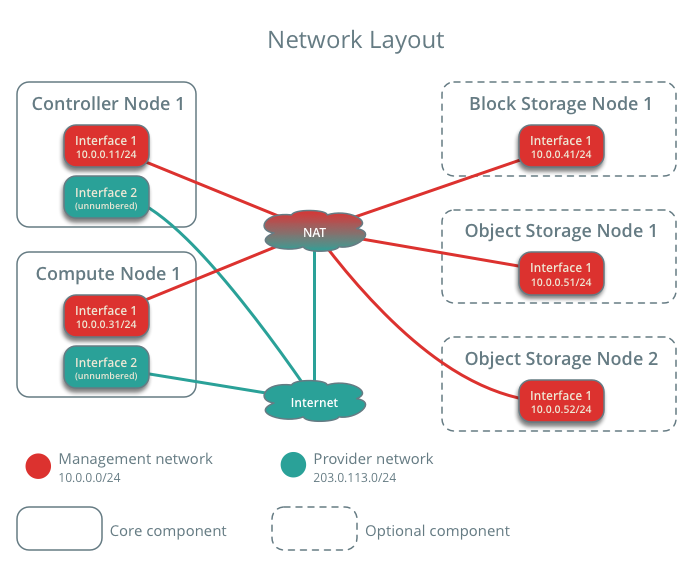 To highlight the importance of network separation, the example architectures use private address space for the management network and assume that the physical network infrastructure provides Internet access via NAT or other methods. The example architectures use routable IP address space for the provider (external) network and assume that the physical network infrastructure provides direct Internet access. Network interface names vary by distribution. Traditionally, interfaces use eth followed by a sequential number. To cover all variations, this guide refers to the first interface as the interface with the lowest number and the second interface as the interface with the highest number. Unless you intend to use the exact configuration provided in this example architecture, you must modify the networks in this procedure to match your environment. Each node must resolve the other nodes by name in addition to IP address. For example, the controller name must resolve to 10.0.0.11, the IP address of the management interface on the controller node.